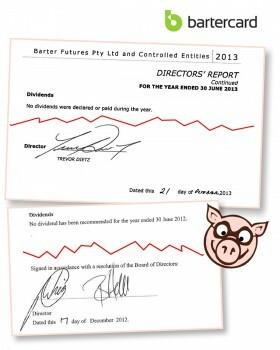 Bartercard’s “NO DIVIDEND” mantra will continue . . . for very good reason! BPS is a PIG. Bartercard has just listed on the ASX (BPS) and the share price immediately dropped. This trend will continue. I advise all investors to sell now quickly, if they can, for the share price will surely only drop further as their various activities continue to come to light. In this post I detail how they secured their funding, following the money and analysing their top 20 shareholders. This is a company that is essentially funded by friends, family and fools. Enjoy. 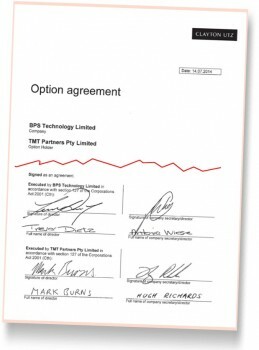 The BPS Technology (Bartercard) IPO was a stitch-up by three directors using corporate tricks to engineer personal gain. It was their only option to avoid serious loss, but their moves have effectively pushed those enormous losses out onto others. As I blogged on first release of the Prospectus, their business model doesn’t and has never made sense . . . the company has been in serious decline for the last five years; has never paid a dividend; uses its investors, staff and partners for Director’s personal gain [dare I say, survival! ]; has a string of serious international business failures; has massive off-balance debts; survives in a large part through a steady GST/VAT tax rort and is the least respected name in the barter industry from decades of aggressive, predatory and immoral conduct. As I also detailed in my previous posts, the IPO was a desperate method to secure a return on their poor investment when they engineered a takeover/buyout of founder Wayne Sharp’s creation a couple of decades ago. Details were taken from ASX dated 3 September 2014. Colour coding is my best efforts. Six other investors have 10,000 shares or more. A strong influence of family is seen with the colour codings of the three Directors, Trevor Dietz, Brain Hall and Tony Wiese. This company is not and will never be an effective ASX trader. Who will buy into a family affair? I don’t yet know the significance of the entry/sale/editing of Mrs Imilian Wiese and Mrs Veronica Ruth Dietz. This may be mothers or wives or other family but the three similar values (totalling $3,850,500) indicate an agreement. I’m sure that the tipline will inform me of the details of these relationship in due course. The point though that this is the first of the three F’s of investing into risky ventures: FAMILY. The second F is FRIENDS. Friends come in various forms and the easiest way to find a friend is to pay them. 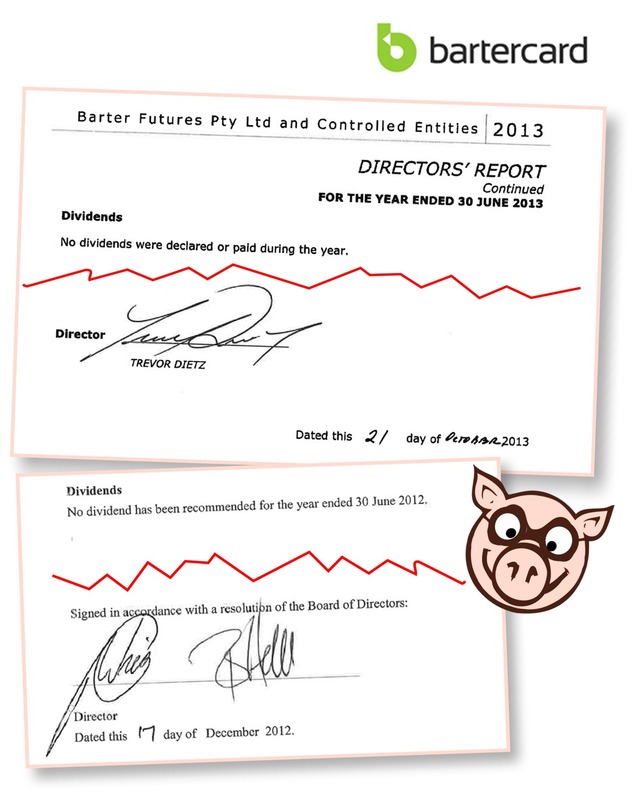 Buying a friend (or two in Bartercard’s case) can be done a million ways but investigators will do well to assess the roles of two non-executive Directors on the BPS Technology and their roles on the Boards of the corporate entities marked in Orange. FOOLISHNESS is the third F. Those who didn’t do due diligence; who listened to and believed the BPS Technology Directors story or who read their dodgy Prospectus and believed it deserve to lose their money. Searching “Bartercard” or even “BPS Technology” in Google would have brought my website and blogs of warning to their attention. I have been available for any question to any person, and just like with the people who invested into conman Daniel Evans’ Ormita fraud, they too will eventually rue their foolishness as the Bartercard business will continue on its merry way, without dividends and with increasing light upon their commercial [mis]conduct. There are other categories of investor not obvious from the publicly available figures. These include the Bartercard staff, and Bartercard’s business partners. There are 443 investors with less than 100,000 shares and half of them are less than 5,000, most likely all sitting on or around the 2,500 minimum. One of the easiest ways to secure larger numbers of investors will have been to build hype amongst staff and those involved in the company. If secrecy is added to hype, it has a magic appeal to the uneducated and uninformed. “This opportunity is an amazing, limited [once in a lifetime], secret only for you and your friends” is the way that hundreds of people within the Bartercard fold could get drawn in. Playing with Bartercard “funny money” would also be easy to do deals in regards to wages, bonuses and other remuneration so that cash can be sucked out of those close to the company, and the required numbers for listing achieved. Wages (a major cash component of the Bartercard operations) could be reduced and deals done to channel what limited cash that they did do for. There are funny things happening the shares numbers that have been quoted around the place. I will update my assessment as more information comes in but it strikes me as very likely that business partners will have received some form of benefit for their various roles in the Bartercard float. Immediately to mind are the non-ececutive Directors who are also on the Board of some of the corporate investors – the only reason that people do silly things like throw good money at bad investments is if there is a reason to do it. Investigators should be lookign in this direction and following the money, analysing the entire share register to see who got what, then asking why. Did the Executive of IRTA pick up anything, directly or indirectly; are there other trade exchanges that will be doing deals with Bartercard in the near future who played with the BPS fire; who is selling up their shares quickly and why – especially if there is an initial loss. I have questions over the shareholding from out of the Australiasian region for the listing was only availble to NZ and Australian residents. UK and USA shareholders? I have questions relating to the offering in the Prospectus. When and how were any share purchases made with Trade Dollars? More on this all in due course, no doubt! I think there are a few skeletons in there. There are couple of lucky investors, Mark Burns and Hugh Richards from TMT Partners Pty Limited. 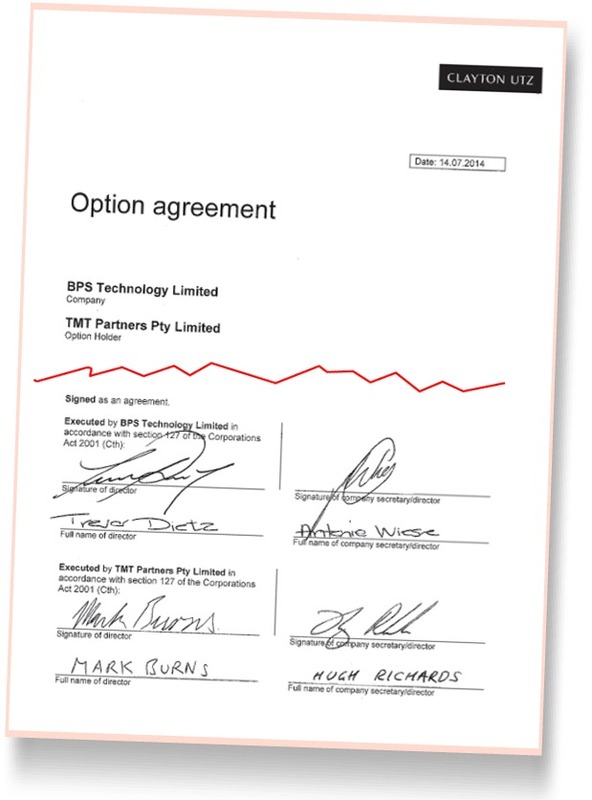 They took out a share option agreement on 17 August 2014, which will have cost them $10.00 AUD. Smart move guys. You’ve lost ten bucks but you’ve saved yourself a lot of pain. Lucky you! When I initially read [and re-read] the BPS Prospectus, I blogged about their extremely poor business model. I couldn’t see how either the numbers stacked up, or how anyone with half a brain would invest believing that a company with such poor performance and massive debt could suddenly turn around and post such a phenomenal profit. The first breakthrough in cracking the nut of this ‘con’ was a comment I received via the tipline that indicated a pre-subscription. The IPO listing was an ultra-short 1 month. Halfway through the IPO period, I could see very little marketing around the BPS offering which tended to indicate that this theory had validity and the nut was well-cracked for me when word started coming through that they were already subscibed. But how? Who were these guys and why did they invest? I’ve always considered that the only way that the money could come in is if it was people using other peoples’ money. Sure enough the proof is out there now. Following the trail of friendly relationships between these directors allowed me to crack the nut of who these shysters managed to secure their corporate funding. The nut is now fully open in my mind . . . people who do the research too will see what I see . . . a clever trail of backroom deals in the guise of an IPO. The IRTA deal whereby the IRTA Executive fed Bartercard PR support into the mix; the stories to the public about an IPO; the deals done beforehand with Bartercard staff; the burying of massive liabilities and trashing of existing partners and investors is and was all for one thing only . . . money. There will be a lot of people laughing at the moment . . . Trevor Dietz, Brian Hall and Tony Wiese have been laughing all the way to the bank, as will Tony Falkenstein who quit his New Zealand problem and saved his bacon somewhat; Wayne Sharp who got away with it and actually got paid [Wow! Who would ever have thought that that could have happened a year or so ago?] and the others who all got a little slice of the payout. If it is the mothers of these three BPS Directors who have funded their little boys into the business then they will have won at the hands of the other little old ladies who have invested their life savings into the superfunds that have bought into the new Bartercard iteration. In some ways it’s kinda cute really, except for the people who’ve paid the price over the years . . . previous Bartercard members, shareholders and the taxman. In my next post I present the Bartercard complex in visual form showing where and how the various tentacles of the Bartercard octopus reach, and how the entire shebang fails to impress me when it comes to ethics. Thanks for reading and feel free to add to this, filling in the gaps or correct me on any matter I’ve mentioned. It’s people like you who keep me blogging about this blot on the corporate landscape. Hopefully I’m still heading pretty much in the right direction! We have proved under the most unfavorable circumstances that Bolshevism can be overcome if one wishes to do so, if one uses the proper means and if one is determined to oppose the powers of destruction with all one’s strength and all one’s manly courage. May the world follow Germany’s example. Well, well, well, Mr Sharpe. Lets stick with the real facts about how Bartercard got started. It is my understanding that you entered the Barter industry in around 1990 when you as a director of one of your companies was contracted to be sell licences for the first Trade Exchange in Australia called the Australian Contrabanc. Brian Hall and Andrew Federoski where licensees of that first Trade Exchange in Australia.. It is further my understanding that You Hall and Federoski proceeded to attach the client base of that trade exchange with lies and innuendos in order to get their clients to join Bartercard. You and your associates Hall and Federoski copied all the intellectual property of the Contra Banc and used same to get Bartercard going. It now appears you all have rewritten Bartercards history the way you wont the public to see it to stroke all your egos. The truth will come out about how Bartercard really started with lies and deceit and it appears that the culture has not changed up to this time. I can agree with you on one point, without you driving Bartercard in its early years it would not be here now. If you wish to rewrite Bartercards history tell the whole story Mr Sharpe. The Truth had to catch up with you all one day. In regards to truth catching up, there is objective truth but there are different levels and forms of perceived truth. The current (and past Directors) put their side across naturally with quite a spin. The disgruntled members have their side and this can be skewed too. I want to be seen as getting as close to the objective truth as I can.